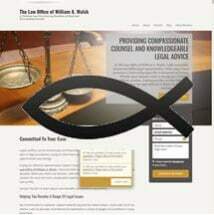 The Law Office of William A. Walsh in Granbury, Texas, is a Christian law firm dedicated to providing comprehensive family law services to clients throughout Hood County and surrounding counties. With over two decades of experience, attorney Walsh is licensed to practice in all Texas state courts and before the Supreme Court of the United States. Attorney Walsh is a devoted Christian who strives to bring his beliefs to bear in everything he does. He believes that people should not have to choose between quality and affordability and gives his clients the vigorous personal representation they deserve at a rate they can afford. Attorney Walsh also is experienced in contract disputes, estate planning and probate and employment law. For clients dealing with an issue relating to the Deceptive Trade Practices Act, attorney Walsh is thoroughly familiar with Texas’ primary consumer protection statute and takes the necessary legal steps to secure compensation for wrongdoings. The Law Office of William A. Walsh accepts credit cards and offers free initial consultations, including on nights and weekends. Attorney Walsh always keeps the best interests of his clients foremost in his mind so they have the best chance of a favorable outcome.